This tutorial shows you how to use Jenkins to orchestrate building a simple Java application with https://maven.apache.org/[Maven]. If you are a Java developer who uses Maven and who is new to CI/CD concepts, or you might be familiar with these concepts but don&apos;t know how to implement building your application using Jenkins, then this tutorial is for you. The simple Java application (which you&apos;ll obtain from a sample repository on GitHub) outputs the string "Hello world!" and is accompanied by a couple of unit tests to check that the main application works as expected. The results of these tests are saved to a JUnit XML report. If you&apos;ve already run though link:..[another tutorial], you can skip the <> and <> sections below and proceed on to <>. (Just ensure you have link:https://git-scm.com/downloads[Git] installed locally.) If you need to restart Jenkins, simply follow the restart instructions in <> and then proceed on. include::doc/tutorials/_prerequisites.adoc ** link:https://git-scm.com/downloads[Git] and optionally link:https://desktop.github.com/[GitHub Desktop]. Obtain the simple "Hello world!" Java application from GitHub, by forking the sample repository of the application&apos;s source code into your own GitHub account and then cloning this fork locally.
. Ensure you are signed in to your GitHub account. If you don&apos;t yet have a GitHub account, sign up for a free one on the https://github.com/[GitHub website]. . Fork the https://github.com/jenkins-docs/simple-java-maven-app[`simple-java-maven-app`] on GitHub into your local GitHub account. If you need help with this process, refer to the https://help.github.com/articles/fork-a-repo/[Fork A Repo] documentation on the GitHub website for more information. . Clone your forked simple-java-maven-app repository (on GitHub) locally to your machine. To begin this process, do either of the following (where <your-username> is the name of your user account on your operating system): If you have the GitHub Desktop app installed on your machine: .. In GitHub, click the green Clone or download button on your forked repository, then Open in Desktop. .. In GitHub Desktop, before clicking Clone on the Clone a Repository dialog box, ensure Local Path for: * macOS is /Users/<your-username>/Documents/GitHub/simple-java-maven-app Linux is /home/<your-username>/GitHub/simple-java-maven-app Windows is C:\Users\<your-username>\Documents\GitHub\simple-java-maven-app Otherwise: .. Open up a terminal/command line prompt and cd to the appropriate directory on: * macOS - /Users/<your-username>/Documents/GitHub/ Linux - /home/<your-username>/GitHub/ Windows - C:\Users\<your-username>\Documents\GitHub\ (although use a Git bash command line window as opposed to the usual Microsoft command prompt) .. Run the following command to continue/complete cloning your forked repo: + git clone https://github.com/YOUR-GITHUB-ACCOUNT-NAME/simple-java-maven-app + where YOUR-GITHUB-ACCOUNT-NAME is the name of your GitHub account. Well done! You&apos;ve just used Jenkins to build a simple Java application with Maven! The "Build", "Test" and "Deliver" stages you created above are the basis for building more complex Java applications with Maven in Jenkins, as well as Java and Maven applications that integrate with other technology stacks. The link:https://jenkins.io/doc/tutorials[Tutorials overview] page for other introductory tutorials. The link:https://jenkins.io/doc/book[User Handbook] for more detailed information about using Jenkins, such as link:https://jenkins.io/doc/book/pipeline[Pipelines] (in particular link:/doc/book/pipeline/syntax[Pipeline syntax]) and the link:/doc/book/blueocean[Blue Ocean] interface. The link:/node[Jenkins blog] for the latest events, other tutorials and updates. The first thing you start to play this tutorial is that get a git repository. Please execute following command to get initial code from internal git server.
. Go back to Jenkins, log in again if necessary and click create new jobs under Welcome to Jenkins! + Note: If you don&apos;t see this, click New Item at the top left. . In the Enter an item name field, specify the name for your new Pipeline project (e.g. simple-java-maven-app). . Scroll down and click Pipeline, then click OK at the end of the page. . ( Optional ) On the next page, specify a brief description for your Pipeline in the Description field (e.g. 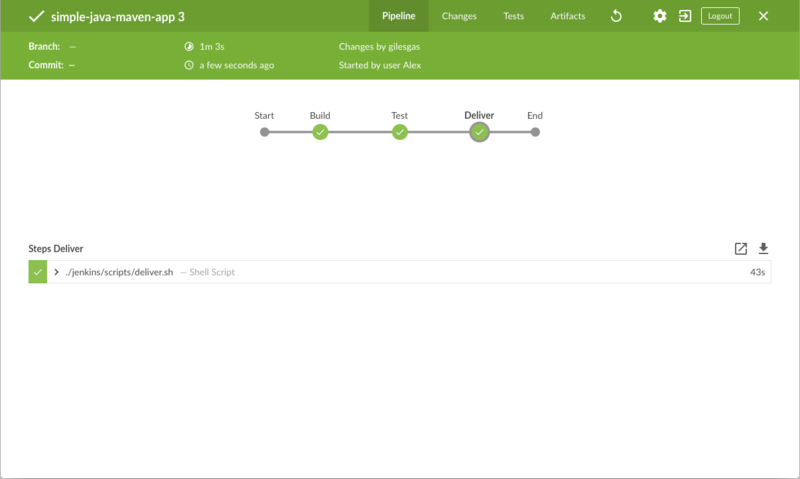 An entry-level Pipeline demonstrating how to use Jenkins to build a simple Java application with Maven.) . Click the Pipeline tab at the top of the page to scroll down to the Pipeline section. . From the Definition field, choose the Pipeline script from SCM option. This option instructs Jenkins to obtain your Pipeline from Source Control Management (SCM), which will be your locally cloned Git repository. . From the SCM field, choose Git. . In the Repository URL field, specify the directory path of your locally cloned repository <>, which is from your user account/home directory on your host machine, mapped to the /home directory of the Jenkins container - i.e. For Windows - /home/Documents/GitHub/simple-java-maven-app . Click Save to save your new Pipeline project. You&apos;re now ready to begin creating your Jenkinsfile, which you&apos;ll be checking into your locally cloned Git repository. 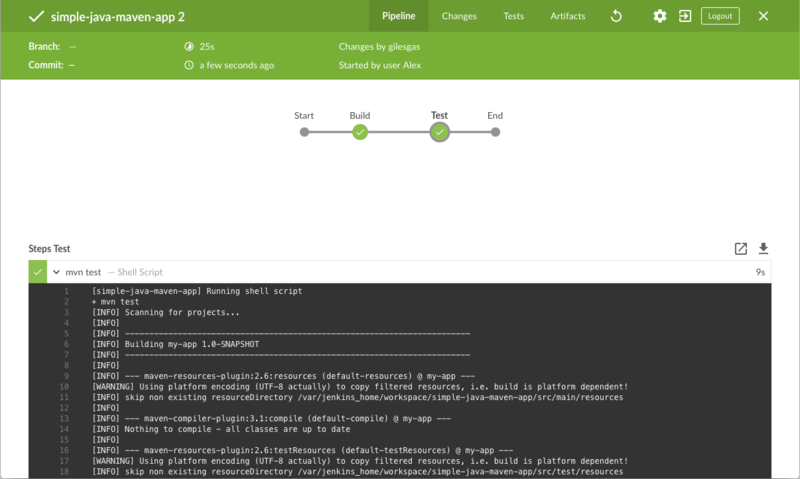 You&apos;re now ready to create your Pipeline that will automate building your Java application with Maven in Jenkins. Your Pipeline will be created as a Jenkinsfile, which will be committed to your locally cloned Git repository (simple-java-maven-app). This is the foundation of "Pipeline-as-Code", which treats the continuous delivery pipeline as a part of the application to be versioned and reviewed like any other code. Read more about Pipeline and what a Jenkinsfile is in the link:/doc/book/pipeline[Pipeline] and link:/doc/book/pipeline/jenkinsfile[Using a Jenkinsfile] sections of the User Handbook. First, create an initial Pipeline to download a Maven Docker image and run it as a Docker container (which will build your simple Java application). Also add a "Build" stage to the Pipeline that begins orchestrating this whole process. You&apos;ll have separate Jenkins and Maven containers running locally in Docker. <1> Defines a stage (directive) called Test that appears on the Jenkins UI. <2> This sh step (of the steps section) executes the Maven command to run the unit test on your simple Java application. 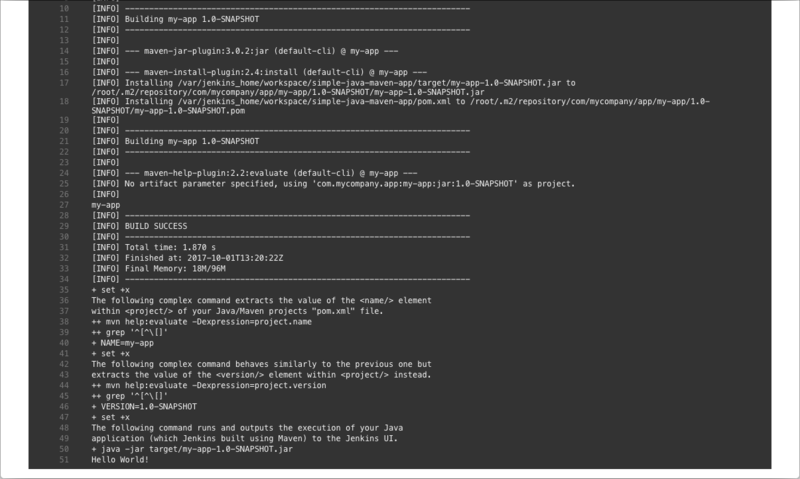 This command also generates a JUnit XML report, which is saved to the target/surefire-reports directory (within the /var/jenkins_home/workspace/simple-java-maven-app directory in the Jenkins container). <3> This junit step (provided by the JUnit Plugin) archives the JUnit XML report (generated by the mvn test command above) and exposes the results through the Jenkins interface. In Blue Ocean, the results are accessible through the Tests page of a Pipeline run. The post section&apos;s always condition that contains this junit step ensures that the step is always executed at the completion of the Test stage, regardless of the stage&apos;s outcome. . Save your edited Jenkinsfile and commit it to your local simple-java-maven-app Git repository. E.g. Within the simple-java-maven-app directory, run the commands: + git stage . + then + git commit -m "Add &apos;Test&apos; stage" . 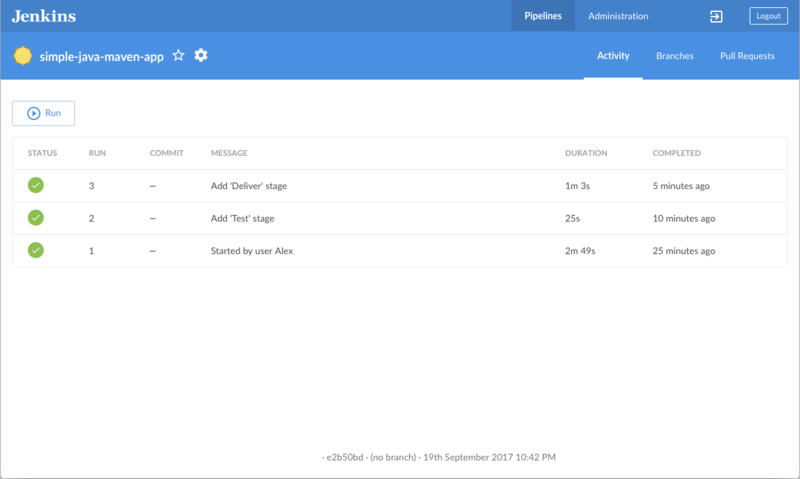 Go back to Jenkins again, log in again if necessary and ensure you&apos;ve accessed Jenkins&apos;s Blue Ocean interface. . Click Run at the top left, then quickly click the OPEN link which appears briefly at the lower-right to see Jenkins running your amended Pipeline project. If you weren&apos;t able to click the OPEN link, click the top row on the Blue Ocean interface to access this feature. + Note: You&apos;ll notice from this run that Jenkins no longer needs to download the Maven Docker image. Instead, Jenkins only needs to run a new container from the Maven image downloaded previously. Also, if Docker had not restarted since you last ran the Pipeline <>, then no Maven artifacts need to be downloaded during the "Build" stage. Therefore, running your Pipeline this subsequent time should be much faster. + If your amended Pipeline ran successfully, here&apos;s what the Blue Ocean interface should look like. Notice the additional "Test" stage. You can click on the previous "Build" stage circle to access the output from that stage. [.boxshadow] . Click the X at the top-right to return to the main Blue Ocean interface. <1> Defines a new stage called Deliver that appears on the Jenkins UI. <2> This sh step (of the steps section) runs the shell script deliver.sh located in the jenkins/scripts directory from the root of the simple-java-maven-app repository. Explanations about what this script does are covered in the deliver.sh file itself. As a general principle, it&apos;s a good idea to keep your Pipeline code (i.e. the Jenkinsfile) as tidy as possible and place more complex build steps (particularly for stages consisting of 2 or more steps) into separate shell script files like the deliver.sh file. This ultimately makes maintaining your Pipeline code easier, especially if your Pipeline gains more complexity. Save your edited Jenkinsfile and commit it to your local simple-java-maven-app Git repository. E.g. Within the simple-java-maven-app directory, run the commands: + git stage . + then + git commit -m "Add &apos;Deliver&apos; stage"
Go back to Jenkins again, log in again if necessary and ensure you&apos;ve accessed Jenkins&apos;s Blue Ocean interface.